Seeing the world through Dodger Blue colored lenses. Zack Greinke for President. Finally a Dodgers Post… Sort of. Sometimes we got lucky and Tata would take us to a game. As the days grow longer and the snow begins to melt…who am I kidding? I live in Southern California. I’m pretty sure the average temperature in Huntington Beach this “winter” was like 78 degrees. We pay no mind to prognosticating groundhogs in the Golden State. But do not mistake our lack of harsh winter weather as indifference toward the beautiful season that is spring. Spring means one thing… baseball. Saturday marked the commencement of Dodger Spring Training in my home state of Arizona. And I must say, it feels good. The knowledge that Clayton Kershaw is getting that big, Texan left arm loose under the Phoenix sun brings me much comfort. Even my ears start to get happy around this time of year. They know that in just over a month, they’ll be taking in the silky smooth voice of Vin Scully. I know what you’re thinking. “Happy ears? This guy is weird. It’s just a game.” For this kid from Arizona, Dodger baseball is much more than that. I was born during the off-season, the time of year when the boys in blue let their bones rest and minds clear after a long season of sore arms and doubleheaders. The first thing I ever wore was a Fernando Valenzuela onesie. There I am, red-faced and presumably still shaking from the traumatic experience of being pushed out of my comfy studio apartment, aka my mom. The onesie is white with elegant blue letters sprawling across the chest. The number “34,” in a contrasting bright red, flashes just below my tiny ribs. I keep the picture in an old shoe box on the top shelf of my closet. Proof of my lifelong loyalty to the greatest team that ever graced a baseball diamond. During the middle of the ’91 season my mother packed my brothers and I in her Nissan Sentra, jumped on the 10 freeway eastbound and didn’t stop until we had arrived in Chandler, Arizona. Well I’m sure she stopped for gas. Probably in Blythe. Ewww. I hate that city. I was four years old and about to start Kindergarten. Brett Butler was leading off, Mike Scioscia was our backstop and the Diamondbacks were still just snakes that slithered in the Superstition Mountains. I missed my Dad, I missed my Nana and Tata (by now you should know who they are) and I was sure that the heat was slowly killing me. As time progressed, we adjusted to life in the desert. My aunt had made the journey from Los Angeles as well, bringing my two cousins with her. The two mothers worked as a team, taking odd jobs with alternating schedules that enabled one of them to be home with the kids while the other worked. With six kids between them, I’m certain they struggled financially, but their children would have never known. When it’s a 120 degrees outside, there are only a couple of places you can take six kids that doesn’t cost half a month’s rent. Needless to say, we swam in a lot of public pools and saw a lot of movies. My mothers would cram all of us into one of their cars and we’d head off to the local dollar theater. Equipped with two of the largest purses you can imagine, they would let us pick whatever movie we liked, as long as we didn’t go alone. One of the most regrettable moments of my childhood came when I chose to see “Homeward Bound” instead of “The Sandlot.” Talking dogs over Benny the Jet Rodriguez? The damn movie is about a kid who grows up to play for the Dodgers! Are you kidding me Aaron? I’m so ashamed. But in my defense … I never saw the trailer. Once the lights were turned down, out came those gigantic purses. Homemade hot dogs wrapped in foil and soda pops went down the line of kids like car parts in a Ford assembly line. We would stay all day, sneaking from movie to movie, soaking up as much air-conditioning as possible. Not a bad day for eight bucks. When I played T-ball, my mom coached the team. On Halloween, we always had the best costumes. My mother and aunt volunteered at our schools. Like I’ve said before, I can barely keep my fish alive. As promised, I made the drive to my Nana’s house this weekend to try and clean out her hard drive. I failed miserably, but Nana didn’t care. She just wanted to see her “Mijo.” She had an envelope set aside that she was dying to show me. Inside was an old newspaper clipping folded in half, yellowed with age. I unfolded it as Nana held her breath and tried not to pee her pants from excitement. There we were. My Momma and I, front page news. I was a Cub Scout, she was my Den Leader and we were watching my car race in the Pinebox Car Derby. The expression on my face is priceless. I don’t know how my Momma did so much for us with so little, but she did it well. The day after she passed away, I got a phone call from her favorite Dodger… Mr. Steve Garvey. As you can imagine, the women needed a break. Every summer, they would send the kids back to L.A. for a few weeks. My siblings and I spent the time with my Dad, and my cousins usually went to Nana and Tata’s house. Crunched for quality time with his kids, my Dad would take time off of work and take us to places that Mom couldn’t afford like SeaWorld and Olive Garden and wait for it… baseball games. It never failed. 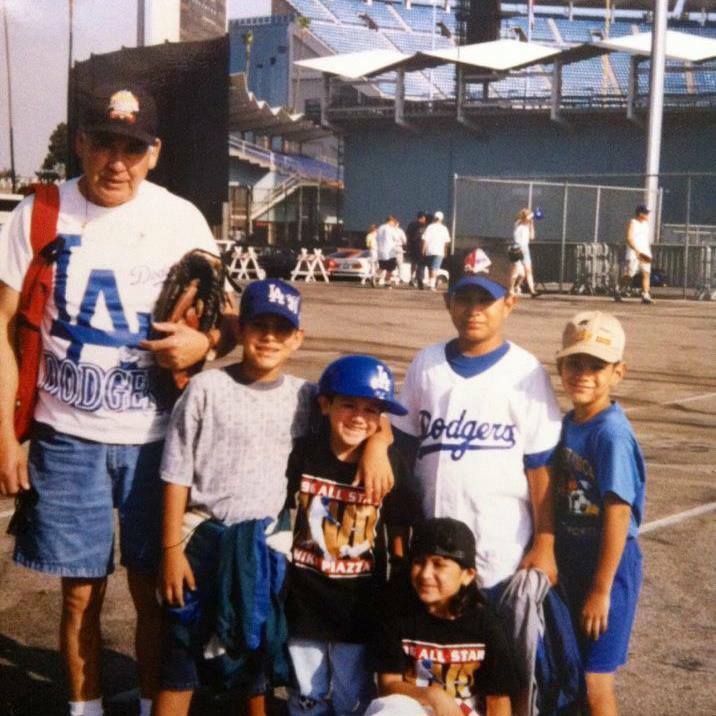 Dad would ask us if we wanted to go to Anaheim and see the Angels or L.A. to see the Dodgers. Like he had an option. For three brothers who spent most of their time in the desert, Chavez Ravine was an oasis. Mike Piazza, Hideo Nomo and Raaauuuuuuuul Mondesi were our heroes. We cheered until our voices were hoarse and ate enough Dodger Dogs to satisfy our pallets until the next summer. Dad made sure we never booed the opposing team, not even the Giants. When our time in Los Angeles neared its end, we would spend the last week at Nana’s house. Reunited with our cousins, we wreaked havoc on our grandparent’s neighborhood. We climbed trees, rode bikes and played baseball with the local kids until we got hungry. Sometimes after lunch, my Tata would bring out a huge tarp from his garage and steal a bottle of dish soap from my Nana’s kitchen. Water hose in hand, my grandfather would keep the tarp wet as we perfected our head-first slides until the sun set. All the while, Vin Scully’s voice could be heard through the window of my grandfather’s room. Smelling like Palmolive dish soap, I would pick oranges from the tree in the backyard and take a break from my pop-up slides to listen the game. Twenty years later, Vin Scully’s voice still smells like oranges. Ray Charles, an avid listener of Scully’s broadcasts, was once asked what man he would most like to meet. Mr. Charles quickly responded, “Vin Scully.” Blind since the age of seven, Ray went on to say, “You’ve got to remember that for me the picture doesn’t mean anything, it’s all about the sound.” I feel you Ray. I could write another 5000 words about my upbringing and how the Dodgers were always there, Mr. Scully’s voice permeating through the scenes as if he was my own personal commentator. I can tell you about how I met Sandy Koufax and Vin, sat with Tommy Lasorda, made fun of Giants fans with Matt Kemp and served Andre Ethier unlimited bread sticks and salad. I can describe the beautiful smile on my mother’s face when she lie in her hospital bed, pumped with chemo, going through the box of memorabilia that Steve Garvey had sent her. I can share hilarious stories about my Uncle Carlos and our adventures at Dodger Stadium. He was schizophrenic and had no social filter, whatsoever. The coolest dude I’ve ever known. I’ll tell you about him one of these days. The point is that baseball is more than a game. The Dodgers aren’t just a team. The Dodgers are summers back home with my father and grandparents. They are precious memories with my brothers, cousins and uncle. They are my Momma’s childhood crush on Steve Garvey. For a poor Angeleno family living in a desert that finally had their own baseball team, the Dodgers were an identity. So maybe it’s not weird that my ears get happy in February. That’s okay, I’m fine with it. Opening Day is just around the corner.